Humans tend to blame themselves when canine kids get sick. They wonder: What did I do wrong? Am I doing enough? Does he hate me for letting them amputate his leg? Living in the moment is hard when there are so many opportunities to allow blame and guilt into our lives. So how do you keep cancer’s evil twins out? 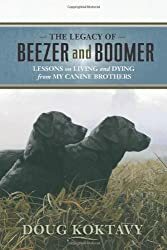 Read “The Legacy of Beezer and Boomer: Lessons on Living and Dying from My Canine Brothers.” When I got sick, it was the most powerful tool my pawrents found to help them cope with the emotional toll that cancer took on our pack. Others agree that is an awesome book. Doug Koktavy, the book’s author, was just honored with three different awards by Colorado Independent Publisher’s Association. In March, The Legacy of Beezer and Boomer received the honor of first place in the “Self Help” category, as well as Merit awards in Spirituality and Memoirs. This is the kind of book that will calm the fears you have about the decisions you are facing and teach you how to make the most of every day without letting regret and remorse get the best of you and your canine kid. Whether you are in the midst of coping with the shock of diagnosis or mourning the loss of your beloved friend, this book will help with your emotional healing. Luv you guys too! You’re the best! Did I tell you how much we love you? xoxoxoxoxoxoxoxo Thanks! Keep tissues handy. Oh while you’re waiting for it, be sure to check out Doug’s website he had up before the book was published, it’s also really great.